Crown Publishing Group (NY), 9780307984760, 293pp. 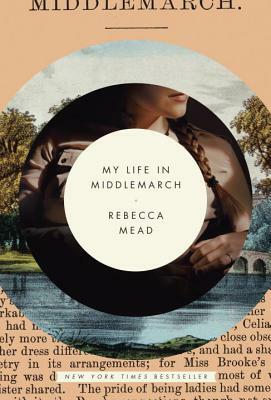 Explore the parallels between George Eliot’s life and Rebecca Mead’s. In their relationships and in their careers as writers, do they share a common approach to the human experience? Did the social constraints of Eliot’s gender put her at a disadvantage compared to contemporary writers, or did the constraints enhance her imaginative powers? Discuss your own experience with Middlemarch, whether you’ve been a lifelong devotee or have only glimpsed it through Mead’s lens. Which storylines and relationships resonate the most with you? Which characters are the most intriguing to you? What motivates Mead to retrace Eliot’s life? How does her research reshape her view of Eliot’s imaginary communities? Browse the memoir’s chapter titles (which mirror the titles of the eight books in Middlemarch) as well as the epigraphs. What makes these lines equally appropriate for Mead’s modern world? Which epigraph could make an apt motto for your life? What came to mind when you read Virginia Woolf’s characterization of Middlemarch as “one of the few English novels written for grown-up people”? Are happy endings and the marriage plot the stuff of childish fantasy? How does Eliot rank against Jane Austen, the Brontës, and Woolf as English women writers who contributed to your growth? How do the various locales featured in My Life in Middlemarch—from New Haven and New York to Coventry, Oxford, and London—reflect the inner worlds described in their corresponding scenes? For Eliot and Mead, where is home? As you read Mead’s exploration of Dorothea Brooke Casaubon, who wrestles with the yearnings of youth and must eventually confront the passionless marriage that marks her adulthood, how did these scenes compare to your own transformation, during and well beyond adolescence? Which books helped you find your way? What freedoms and limitations did Eliot experience because of her unconventional relationship with George Henry Lewes? In your opinion, how did he and his sons (biological or not) affect Eliot’s approach to writing about male characters? From the duped scientist Tertius Lydgate to the feckless Fred Vincy, what broad observations can we make about the men who populate Middlemarch? What does Mead’s memoir help us understand about motherhood in its many forms (including Eliot’s experience as a quasi-stepmother)? Is Eliot’s portrayal of motherhood in Middlemarch realistic or overly pessimistic? Mead describes her pilgrimages to the archives that hold Eliot’s journals, manuscripts, and other documents, including Yale’s Beinecke Library, the New York Public Library, and the British Library. In addition to fact-gathering, what does Mead gain by spending time with pages that were touched by Eliot’s own hand? Does the digital age spell the end of that experience? Mead raises the question of Eliot’s spirituality after she left the church. If her characters are a guide to us, how does Eliot seem to have approached the role of fate versus free will in shaping our destinies? The eight books of Middlemarch were released by Blackwood as a series. How does reading those elaborate plots compare to watching a wildly popular television series? What special benefits does the written word provide? After her dashed hopes with Herbert Spencer and the impossibility of marrying Lewes, was Eliot’s marriage to John Walter Cross a sort of victory? Consider Middlemarch’s renowned closing line, which appears in the first paragraph of “Finale.” Which unhistoric acts, hidden lives, and unvisited tombs did you think of as you read those words?